Guide Professional provides a search analytics dashboard so that you can review Help Center search terms. For each search term you can see the number of searches for that term, number and type of search results returned (if any), click-through, and the next action taken. Note: You must enable Help Center to view search data (see Getting started with Guide). Search data includes end-user searches in Help Center, as well as searches in the mobile SDK and Web Widget, if you have set up those channels. In Support, click the Reporting icon ( ) in the sidebar, then click the Search tab. To filter the data based on the channel where the search was initiated, click All channels, then select Help Center, Mobile SDK, or Web Widget. With no result, searches that returned 0 results. With no clicks, searches where no result was selected. Tickets created, searches that led to a ticket being created. Above each data set you can see the number of searches in the last 30 days for that data set. Hover your mouse over a node on the graph to see the total number for a specific day. Below the detailed graph you can view search data in a table. The Total data set includes data for the top 500 searches overall. Each of the other data sets filters the top 500 search terms accordingly to show data for searches that had no results, no clicks, or resulted in tickets. Click-through rate Percentage of end-users who clicked one of the search results displayed for a search term. If you want to export your results, you can click the CSV button on the upper-right corner of the graph. By default, the file displays the top 1000 search strings across all channels. Search analytics gives you insight into what your customers are looking for and where they are failing to find answers. To make end-users more successful you can analyze search data (review searches with no clicks or no results, look at click-through, notice whether the best content appears in results, and so on), then take actions to improve search results and your knowledge base content. After you make changes, it will take about three minutes before the content is indexed and can be searched. Add labels to content. (Guide Professional) You can add tags to content so that the appropriate content appears in search results. For example, if you see that end-users are searching for "e-mail" but you use "email" without a dash in your content, add a label with the similar term to the content. Update content titles. You can rewrite titles to more closely match end-user searches. For example, if your article is titled "Deleting an email account" and end-users are searching for "removing a user from email," consider updating the title. Break content into smaller articles. You can divide large articles into smaller articles to help customers find what they are looking for. For example, instead of "Managing email" consider smaller articles about "Setting up email," "Adding email accounts," and "Deleting email accounts." Update content body text. You can add common end-user search terms to the body of appropriate articles so that the article appears higher in search results. Remove old content. You can remove old content so that it does not clutter search results and confuse your customers. Update existing content. You can update existing content to be more complete. For example, if end-users are searching for how to schedule a backup, and you have an article on running manual backups but not how to schedule backups, consider adding that information to the article. If scheduling backups is not an option, you might want to add that info to the article so that end-users don't continue looking for an answer. Add new content. You can add content for common searches that aren't yielding any search results. For example, if end-users are searching for "accessing email remotely" and no content exists on that article, consider adding that article to your knowledge base. We've got the same issue as Travis and Marybeth. What's the solution? We need to wait until it's fixed. In the interim, we get periodic status emails from ZD that show us some "Top Trending Searches," and "Search with No Results." Unfortunately, "Search with no Results" is not helpful as the terms listed as not returning results do surface relevant results, so we're not sure what exactly "no results" means. We look at support ticket topics and compare/informally correlate search<->ticket and find that users are seeing appropriate search results. Hi. I have a follow up question / observation. Users need to be signed into our help center to view articles. I've noticed "no result" comprises a huge ratio of our results for terms that definitely generate results when searched. I suspect that ZD reports for searches that are conducted before users are logged in. Can you verify there is no way to exclude these searches that occur before the user logs in? Thanks! If the user is able to search while they are not logged in, those 'no results' searches will in fact be counted and unfortunately there is not a way to exclude these results from the report. Hi - We have many users that search number strings that bring back no results. Is there a way to account for this by saying if the search includes a number string then return a specific article? Or, is there a way to handle no results by actually pointing users to a specific article instead of always showing "no results found?" Hi, is it possible to have this help center search information emailed in PDF form to a nominated address? Hi James, sorry for the delay! Searching for a number string will be the same as searching for a text string: if it's in the article we'll give you the result, and if not we won't. I'm getting pretty high percentages of searches with no clicks (over 80%) and my searches with no result, although lower, are still quite high (47% in W1-W2 2016). I'd like to know if the % of searches with no clicks include the % of searches with no results? I find Sean Williams request very useful. If a search returns no results, then the clickthrough count or the number of clicks should always be zero too. However, the number of search results in the reporting is an average, so it's possible that a clickthrough rate would apply. Search Analytics is very beneficial and we use it to help enhance search effectiveness and identify client documentation needs. Would it be possible to add "End-user" to the search results categories? This would be extremely beneficial to us so that we could engage specific users about search techniques and documentation needs. That's a really great suggestion. I did some poking around in our Product Feedback forum but wasn't able to find anything related to this; I'd encourage you to hop over and post your feedback there! This'll ensure that our Product Managers will see it. Awesome, Pete! Let us know if you need anything else! Hello All! Do we have any ETA on when the Dev/Bugfix issues with the tabular data on the report dashboard not displaying? I am also experiencing issues with the breakdown not loading and that's where all the useful data is! The user Search Strings are missing from the Reporting section of our Zendesk. So we can't see which terms were searched for from the Help Center or the Widget. We're on the professional tier. +1 I really need this back too! 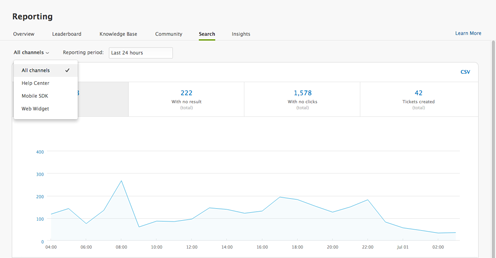 Is this feature, Generate a CSV of the Help Center Search Stats, available via Zendesk API? Hello! Currently we are using Zendesk both as the support service platform and as Help Centre for knowledge base. We have a confusion that when we check in the search funtion most search strings we have is numbers which are always ticket numbers related. The articles in Help Centre can hardly to be related with these tickets numbers so most of the search strings are returned as no results. Just want to confirm for such cases is it because we are not using the search in the right way as numbers might be meanless to the contents in Help Centre? The most likely explanation for the search strings your customers have been entering is that they are navigating to your Guide Help Center to try and review their tickets they have submitted to you. The issue is just as you point out that the ticket numbers do not correspond to Articles and that they should be using the dropdown for being signed in to navigate to My Activities to view these tickets. Please be aware that unless you have Guide Professional the My Activities customer request portal will not be available for end-users to review these tickets. Not sure if this is related to the aforementioned issue with no results but the last couple of months we have an issue when checking top search without results. Several of the top searches include the replacement character (�). Any idea how to solve this? It sounds like for the Top Search results you maybe experiencing a known issue. For the character issue, this I'd like to investigate more as I am not seeing this behavior in my test environment. I am going to create a ticket and reach out to you there. This report on all of our interfaces is not showing the end user search data. We see the graph and can change what shows in the graph, but the End-user search data is just not showing. Did i miss something or is this an issue with out sites? When I say sites, we do have a few seperate sites and not just different brands. Hi Ed! I've created the following ticket #3386832 to check this behaviour further. Thank you for providing the additional information! FYI - I experience the same issue, but you can temporarilly fix this by adding custom dates instead of pre-figured ones. :) By doing so you'll see searches as before. I'm a new Admin and have yet to see search string details populate in our instance. Search stats are populating in the graph, but there are no search details appearing below in the table (search string, total searches, etc.). Does anyone have insight into this? I contacted support and was only told it's a known issue - no fix ETA or context was provided. I'm sorry to hear you're having trouble with this! As you mentioned above, this is a known issue. I checked on your ticket and I see that it's been added to the existing Problem ticket for this issue. That Problem ticket is currently assigned to one of our Developers and we're actively working on the issue. You'll receive an update on the issue through your ticket when the issue has been resolved! I also use the search string details report. Is there a way that I can create a customize report using Good Data? Please notify me too when this is fixed. What is the SSO session length for end-users & Help Center?